A sock monkey is a soft, plush toy perfect for boys and girls of all ages. 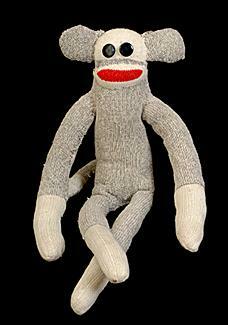 Traditionally made of old socks, even adults cherish the sock monkey toys they owned as young children. Today's sock monkeys are available in a wide range of shapes, sizes, and colors. Authentic sock monkeys are about 20 inches in length, making them a good size toy for children to drag around and sleep with. Available with a hat covering a bald head or a head adorned with yarn-like hair, they make wonderful unisex toys (with the exception of the pink-haired Isabella, the ballerina). If you really want a traditional sock monkey, consider making your own instead of buying a ready-made one from the store. You can find patterns for making them inside each package of Rockford Red Heel socks. These monkeys are often made with button eyes, making them a choking hazard for children under the age of three. If you make your own monkey, you can embroider the eyes on, making them suitable toys for kids of all ages. Craftbits offers a detailed tutorial on making a sock monkey from any pair of long socks. This is a wonderful way to individualize your monkey - your monkey may be solid, striped or wildly patterned. You don't need to be especially skilled with sewing to create a sock monkey. Like easy puppet patterns or sock puppets, this can be a good beginner project for young crafters. If you'd like to make your own, but cutting up a pair of socks sounds a little too intimidating, consider using a sock monkey kit instead. Kits include everything you need to make a sock monkey, from the cut up socks to detailed instructions. Some kits also contain a pre-sewn sock monkey, which includes the poly-fill and embellishments, but doesn't require machine sewing. The kits are only available in the standard red-heel monkey, but they can be a great jumping off point for someone who has never made one before to get started. These fun plush animals have been adapted by a large number of toy companies who have created a variety of toys based on the character. These items make great gifts for kids and collectors alike. Ty Beanie Babies have a series of sock monkey plush toys in lots of different colors and styles. Popular toy maker Schylling offers a basic sock monkey along with a series of other items ranging from a giant-sized monkey to a monkey-themed jack-in-the-box. Brybelly Holdings has created an entire sock monkey family, consisting of two parents and two children. The toys come packed in a cardboard car to inspire pretend play. These toys can all be found at major retailers including Amazon.com online, as well as most major department stores and toy shops. Like many toys of old, sock monkeys were made of castoff objects; in this case, socks. 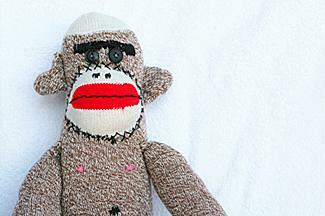 Mothers would take old socks and redesign them into monkey-faced toys for kids to enjoy. Because these monkeys are usually brown or blue, you don't have to worry as much about them getting dirty. If they do get soiled, just toss them in the washer and they'll come out as good as new. 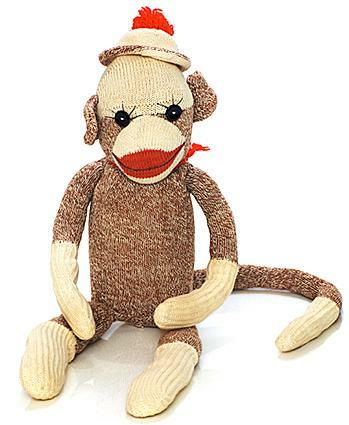 While you can find monkeys made of socks on store shelves, buying them from the Red Heel Sock company is a great way to get a traditional, real sock monkey toy that will last and last. It's also a great way to support American-owned companies as authentic monkeys are handcrafted by Ozark crafters in the U.S.A.
For children (and grownups) who love stuffed toys, sock monkeys are a great gift idea. Anyone who appreciates handicrafts will like the time and skill put into making one. Make a traditional monkey out of Red Heel socks or design your own monkey pattern with any pair of long socks you have on hand. Kids will love having a unique toy of their very own, and you can even please a kitschy adult who's just a big kid inside.